I have taken most of the blog offline temporarily. I am hoping to restore the blog in the near future, and will definitely do so before a transplant surgery takes place. In the meantime, we deeply appreciate your continued prayers for Tricia. You are welcome to follow me on Twitter if you want to continue to receive updates. CLICK HERE for my Twitter page. Thank you. We need your prayers tomorrow (Tuesday) from 7-10am. Tricia is still inactive on the list. We believe that she has done everything that has been asked of her and that the issues that caused her team to deactivate her have been resolved. Tricia's breathing is becoming more difficult, and we know that her window of opportunity for a transplant is getting smaller each day. Tricia's transplant team meets every Tuesday morning to discuss all of their patients. PLEASE, pray that they will discuss Tricia and decide to reactivate her on the list. If you would pray anytime tomorrow, but especially between 7-10am, we would greatly appreciate it. We would also appreciate it if you would invite others to pray for Tricia as well. 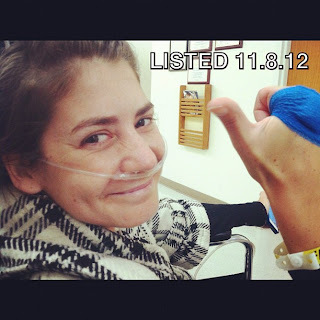 Use the hashtag #PrayForTricia and link to the blog if you can. Thank you in advance. Tricia was deactivated today because she has been having some issues with her stomach for about a week. The pain became so severe that we ended up in the ER late Sunday night. We have no idea what the problem is, and her team is running a bunch of tests this week to try and identify the problem. Deactivation means that she is still on the list, but they will skip her name if lungs become available. Reactivation is very simple, but they have to identify and fix the problem before they'll reactivate her. As I explained in my last post, it is imperative that she gain as much weight a possible...obviously, if she's having stomach pain, it's going to affect her ability to take in calories. PLEASE, pray that her team will be able to take care of this issue as quickly as possible. Thank you. Tricia was listed and activated late yesterday afternoon. We are incredibly thankful. It appeared for a while that it might not happen...not everyone is offered a second double lung transplant, so we consider this a huge blessing. > While the success rate of a first double lung transplant for CFers is well over 90%, a second is typically much more difficult. As Tricia's surgeon explained to us this week, "not ten times more difficult, more like 100 times." This isn't true for everyone...we have one friend who tells us her second TX was much easier than her first...but, we are preparing ourselves for a long recovery. There are bigger risks, like bleeding, clotting, infection, and considering Tricia's immune system is still shot because of the CAMPATH, she is at an even greater risk than most. We've been told, and we know from watching the experience of friends who have gone before Tricia, that Tricia could be in the hospital for several weeks or months as she recovers. > Unlike her first transplant, when we were told that there was a less than 1% chance of finding her a match, she should be a much easier match this time around. The antibodies that were in her system due to blood transfusions and being pregnant with Gwyneth are long gone, which creates a much larger donor pool for her. This is a blessing. However, Duke is more stringent that they were 5 years ago, and because her blood type and antibodies is easier to match, they will be looking for the best set of lungs possible. Five years ago, Tricia was at the top of the list at Duke and in this region, which meant that she was first in line for any set of lungs that were a match. This time around, although we're not sure where she is on the list, we know she's not at the top. The average wait on the list at Duke is around two weeks, and considering she was on the list for six weeks the last time, we are encouraged that she will not wait long. > Her TX team had a difficult time making a decision to put Tricia on the list. She is borderline at best with her weight and strength. Ideally, we would love for her to gain about ten more pounds and be able to spend more time at physical therapy without becoming fatigued. It is incredibly important that she be as heavy and strong as possible going into surgery because she will lose at least ten pounds immediately after surgery. There is the possibility that she could be taken off the list if she were to become sick or lose weight. We are incredibly thankful for her team for making the decision to get her on the list. > We know that Tricia will only get worse from here out. The rejection has caused irreversible damage to her lungs, and she says it feels like every day it gets a little harder to breathe. She is on O2 24/7, about 1 liter at rest and 4-6 liters when active. Her situation is much different than five years ago when she was on a ventilator in the hospital and unable to move from her bed without complete assistance. In many ways she is not as sick as she was then, but in some ways she is more sick. She is dealing with several related issues as well like high blood sugars, high blood pressure, and congestion in her lungs. She is very close to dying...the slightest cold or infection will probably be deadly and, even without those factors she is not going to last much longer with her lungs as they are. We continue to trust God completely. Some things that took place this past week which I can't share with you have proved to us once again that He is the only One Who knows exactly what will happen with Tricia. We don't anticipate anything at this point except that God is in control and will continue to do what is best for Tricia. Humanly speaking, we hope this means new lungs and an extended life, and we understand that the medical odds are against us again. Thank you for your prayers. Let me know if you have any questions. Tricia has had a few rough weeks. Her breathing is continuing to become more difficult. She had had a consistent low grade fever. Yesterday she had her portacath replaced because it may have been infected, and sure enough she woke up today without a fever. Her lung infection remains but doesn't seem to be getting any worse. Her doctors explained to us yesterday that they want her to add a few more pounds and continue to build her strength up before listing her for a transplant. She is getting nearly 100% of her calories from her feeding tube now. Her docs emphasize how critical a position Tricia is in...how close to dying she is right now. We continue to covet your prayers.